One of the more interesting stories of the Blue Jays minor leaguers that has been lost in the shuffle of some higher-profile prospects has been the conversion of shortstop Justin Jackson to pitching. A first round draft pick in 2007, Jackson has struggled with the bat, never hitting over .249 in a season, and playing in only 94 games above A ball, playing a reserve role with AA New Hampshire last year. 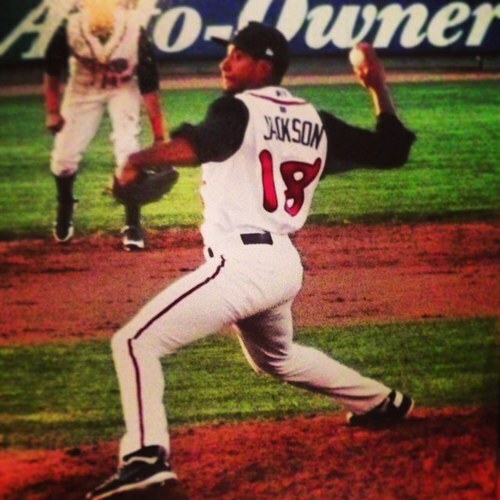 Jackson has always shown a live arm, so the move was somewhat natural. The Jays assigned him to Low A Lansing at the beginning of May, and the results are encouraging. Pitching out of the bullpen, Jackson has appeared in 11 games, and in 17 innings, has and ERA of 1.56, striking out 14 while only walking 8. MWL batters are hitting .191 against him. Still learning to pitch, Jackson throws a low 90s fastball, slider, and changeup. As a former infielder, he fields his position very well. If Jackson isn't added to the 40 man roster at the end of the season, he will be eligible for the Rule 5 draft in November, and will become a six year minor league free agent. The Jays have some thinking to do about him, as a result. Do they promote him to High A to see what he can do against tougher competition ? Will he be worth a spot on the 40 man, or do they risk losing him as a Rule 5 or milb free agent ? Initially used in bases empty situations, he has been used more in high leverage outings . Is he being challenged enough at this level ? Is he ready to move up? This one bears continued watching.